Kelley Cox/Post IndependentThe Cliffhanger roller coaster construction is nearing completion at the Glenwood Caverns Adventure Park. The park's newest ride is being claimed as the highest elevation roller coaster in North America and will open in time for Strawberry Days in mid-June. GLENWOOD SPRINGS – The newest attraction at the Glenwood Caverns Adventure Park, a 50-foot-tall roller coaster perched on a cliff overlooking the city, will be a little late in opening for the summer season. Officials with the Adventure Park had hoped to host the first riders on the Cliffhanger Roller Coaster this weekend, for the Memorial Day holiday. Delays at different stages of the Cliffhanger project, however, have put that opening date back about two weeks. “We’re shooting for Strawberry Days,” said operations manager Nancy Heard, referring to the annual civic festival scheduled for June 15-17 at Sayre Park. The Cliffhanger is billed as the highest adult roller coaster ride in the U.S., in terms of elevation. It will take passengers to the edge of the cliff overlooking the Roaring Fork Valley before making a sharp turn back toward the mountainside and plunging down the track. “It’s puts us in a different league, for sure,” Heard said of the coaster. Other new attractions are open starting this weekend, including the Mine Wheel, a Ferris wheel with cars decked out to resemble ore buckets, and the Wild West Express, a smaller, child-scale roller coaster. The park, owned by Steve and Jeanne Beckley, is reached by a gondola ride from the base near Two Rivers Park in North Glenwood. It offers multiple activities high up on Iron Mountain. These activities include tours through a series of caves that were formed millions of years ago and which were originally the only attraction at the site. It was quite a feat getting the Cliffhanger here from Branson, Mo., where it sat idle at the Celebration City amusement park from 2009-2011, Heard said. The Italian-made ride was new when it was erected in Branson, and ran for about five years before it was shut down for financial reasons, she explained. Adventure Park maintenance manager Kelly Bates (known as “the master” among the park’s crew) is project manager for the Cliffhanger. Bates knew of the idled ride, and started negotiating to buy it before it was even advertised for sale, Heard said. She said the Adventure Park was competing against Elitch Gardens in Denver and Darien Lake Theme Park near Buffalo, New York, to buy the used coaster. 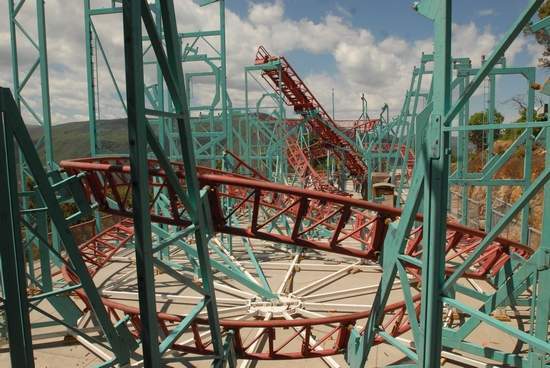 The negotiations resulted in a purchase price of $375,000 for the roller coaster, Heard said. The total cost of disassembly, repairs made to the structure in Branson and to the cars in Florida, and reassembly in Glenwood Springs is expected to be about $800,000. The Adventure Park bought 1,400 new bolts for the reassembly, including 700 special bolts, 14 inches long with metric threads, used to hold the sections of track together. “That’s 50 grand just in hardware,” she said of the bolts. Then came the difficulty of transporting the disassembled, refurbished structure to Glenwood Springs. Heard said it was difficult to sign up a dozen independent truckers, the number needed to ship the disassembled structure to Glenwood Springs. The difficulty, she said, was that “there’s not much return freight” for trucks to pick up once they unload in Glenwood, and an empty truck is something independent truckers try to avoid. Instead, Heard said, the Beckleys turned to shipping brokers, who were able to find the needed trucks. But sometimes several rigs would show up at once, both in Branson to pick up their loads and in Glenwood Springs to unload, she said, prompting a mad scramble for work crews. “It was feast or famine,” Heard said with a wry expression. Once the trucks arrived in Glenwood Springs, the loads had to be hauled up the mountain to the Adventure Park site. That job went to Bates, who would meet the trucks at the gondola base and immediately lead them up Transfer Trail. He stayed mum about the steep, twisty route they were about to drive up. “We had all these flatland truckers with no experience in mountain driving,” Heard recalled. At the site, a tall crane was set up to lift the pieces into place, on top of a specially built foundation slab of concrete. “Because we’re on a cliff, we’re going above and beyond,” Heard said, explaining that roller coasters are typically not anchored to the ground by anything but gravity and their own structural rigidity. In this case, she said, “We’re going to anchor it so it doesn’t walk.” Bolting the coaster to the slab means support struts won’t move under the weight and momentum of the coaster cars zipping over the tracks. The construction is being overseen by Allan Litts of St. Cloud, Fla., who once ran his own park with a roller coaster of the same make and model. All told, Heard said, it has taken a workforce of 20 people to do the job. Five men did the disassembly and repairs in Branson. Five more men refurbished the train cars in Florida. Nine men worked on unloading and reassembling in Glenwood Springs. “Oh, and one gal,” Heard said with a wide grin, raising her hand high and explaining that both she and Bates are now official roller coaster inspectors holding certificates from the National Association of Amusement Ride Safety Officials. Heard said the Cliffhanger will initially operate with only one train on the structure at a time. A second train is ready to roll, however, as soon as demand warrants the added capacity and operator experience makes it feasible.